With encouragement from my circle of friends, my New Year’s resolution was to make 2016 a year of bicycling. The amount of time I’d spent on a bicycle ebbed and flowed over the decades since I ditched training wheels. As 2016 unfolded, I was making significant progress on the goal: To put more miles on my bike than on my car. I was taken aback to be hearing this for the first time. 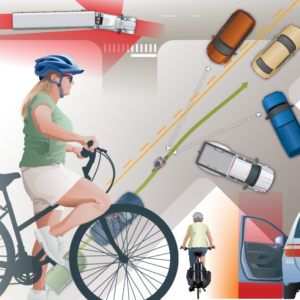 Information this important should be part of EVERY conversation about bicycling for transportation! Matthew further emphasized this point during the next day’s Tour of St. Louis. 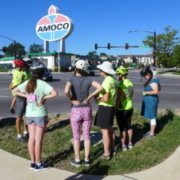 In Forest Park, he walked us to the corner of Clayton Road and Skinker Blvd. There we observed for ourselves the deep ruts in the ground from off-tracking tractor trailers. Matthew Brown (holding his son) shows the evidence of big trucks off-tracking as they turn right. I signed up for CyclingSavvy out of intellectual curiosity. 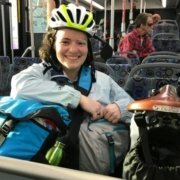 I had been riding for transportation for many years, and was fortunate to have picked up some best practices. I went into the workshop already feeling confident about bicycling in the travel lane. 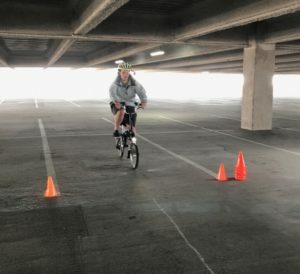 I already signaled my turns, stayed out of the door zone, rode in the same direction as other traffic, used lights at night and had decent bike handling skills. Ten hours later I headed out with new techniques and ideas in my back pocket, should the need arise. My vehicle of choice for travel. 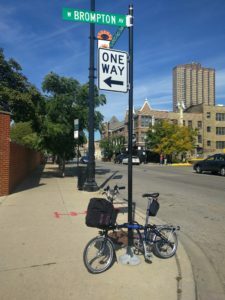 A few months later I found myself with an afternoon to explore Chicago by Brompton. Encouraged by my Sweet Success in Skokie the previous evening, I was excited to enjoy a beautiful fall afternoon. I scribbled a few addresses and directions on a piece of paper, and was off with a power pedal to explore Chicago’s north side. With the Cubs in the World Series and the Chicago Marathon taking place, the easiest way to get around the Windy City would be on my flexible and maneuverable vehicle. I was making my way back from exploring The 606, a former elevated rail track turned into a greenway. I was riding on a road with one travel lane and one bike lane in each direction. There wasn’t on-street parking to create a door zone. The block was long so I’d have a while before I’d need to negotiate with possible right-turning traffic. The winds were strong that day, which gave me another reason to use the bike lane. I was not moving much faster than a pedestrian. I pedaled along my merry way. Out of the corner of my eye I saw a yellow blinking light on the bus passing me in the travel lane. In a split second I had both hands on my brakes, pedals level, and torso over my saddle, throwing my weight back in an emergency stop. Seemingly oblivious to my presence on the road, the bus driver pulled the bus over to its stop right in front of me. I put a foot down and watched as while the bus loaded and unloaded. I took several deep breaths and attempted to compose myself. My understanding of traffic patterns, bicycle handling skills, and brakes in good working order had just saved my life. I don’t know why I was irrelevant to the bus driver. Perhaps he or she saw me and underestimated my speed. Understandably, the driver’s attention was probably on the traffic in front of the bus, and on the passengers on the sidewalk waiting to board. In a perfect world, I would have done more route planning. That day my route planning consisted of a quick check to make sure streets I was using didn’t have door-zone bike lanes. After all, this was a leisurely afternoon ride. If I wasn’t having fun I’d hop on transit. A bicycle lane on a road with regular bus service wouldn’t be my first choice–nor were Chicago headwinds. In my estimation the benefit of traveling at a slow pace outweighed the risk of riding in that bike lane. It was my choice that day in heavy traffic conditions with no other release option. Without a doubt, CyclingSavvy saved my life that afternoon. 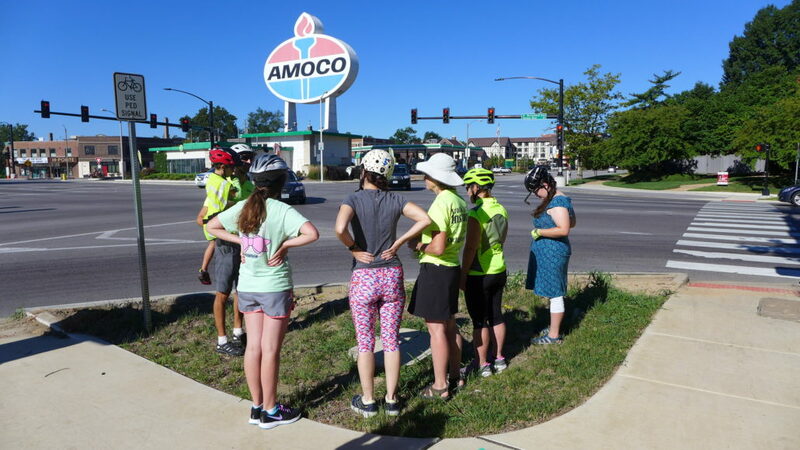 Being an empowered bicycle driver turned a potentially deadly situation into a footnote on an otherwise delightful trip. I’m thankful for the simple ways I can keep myself safe on the road. Friendly way to travel to the “friendly confines” of Wrigley Field. Happy Cubs fans flood the streets near Wrigley Field. The energy is palpable as they cheer the team towards a World Series victory. I’m elated as my folding bike and I squeeze our way out of the crowded Addison ‘L’ (subway) station. When I booked this trip, riding my bike in Chicago seemed as farfetched as the Cubs winning the World Series. I was in Chicago to celebrate my friend’s wedding. As a St. Louis Cardinals fan, my gut instinct was Wrigleyville would be a nice quiet centrally located place to stay. 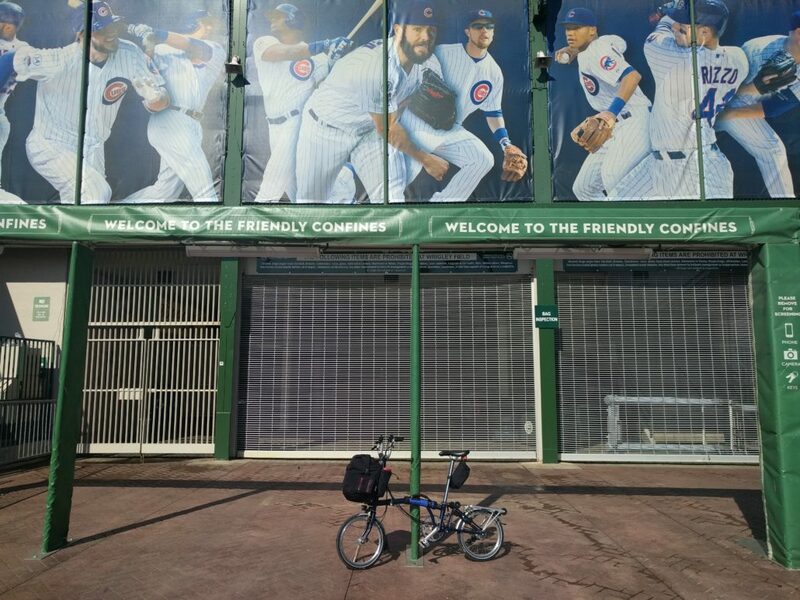 I couldn’t have been more wrong–about the Cubs, or where I’d find myself riding my shiny new Brompton around the Windy City. To prepare for my trip I sat down with Chicago Transit Authority timetables and maps. One place would be hard to reach by transit alone. The night before the wedding, there was a gathering for dessert at a restaurant in Skokie. Bus service was infrequent and terminated at 8 PM. 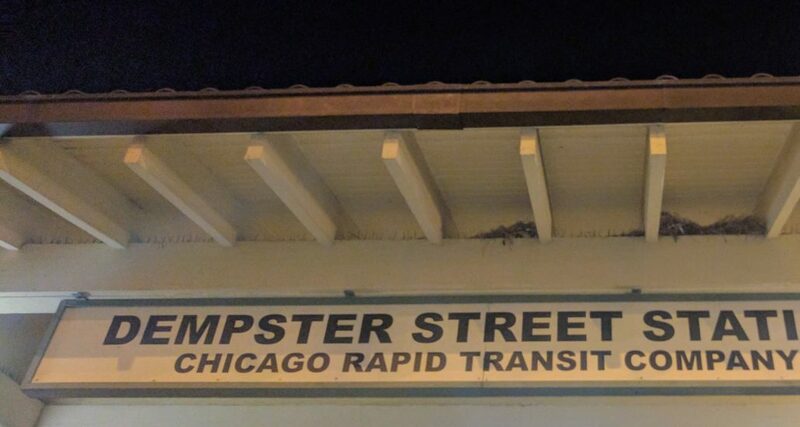 This left me with a gap of nearly two miles from the Yellow Line ‘L’ station to the restaurant. I considered Harold’s suggestion that I go by bicycle. Now that I had a Brompton, if I felt uncomfortable at any time I’d have the option to fold the bike and order a Lyft. OK. I’d at least try my hand at mapping a bike route to meet my friends in Skokie. 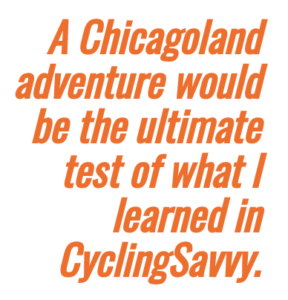 A Chicagoland adventure would be the ultimate test of what I learned in CyclingSavvy. After a decade of cycling for transportation, going by bicycle was already a natural part of vacation for me. I’d found my way around smaller cities like Albuquerque, Kansas City and Madison, WI. I’ve also been to Chicago numerous times and navigated by ‘L’, bus, Metra, and walking. I scoured satellite images and bicycle maps to see what options I had for riding through Skokie. Settling on a route of primarily neighborhood streets, I wrote myself directions to the restaurant. Now I was excited. I eagerly hoped to add greater Chicago to the list of cities I’d biked. An Amtrak and subway ride later, my Brompton and I are happily settled in my Chicago Airbnb. The moment of truth had arrived. That evening I’d find my way from Wrigleyville to Skokie’s Old Orchard Mall to meet my friends, hopefully without resorting to the use of a car. Cue sheet and transit pass in hand, I head north with my bike on the ‘L’. At the Dempster-Skokie stop, I carry my bike down a few steps to exit the platform. I roll up the right leg of my jeans, take a few deep breaths, and head out onto a four-lane road. Trepidation welled up inside me, as my little bike and I took our place in traffic on a big road in a big city. Traffic is light and the lane to my left is available to pass me. My center-of-lane position and dynamo lights communicate that a slow-moving vehicle is in the right hand lane. A few blocks later I signal and turn onto a quiet residential street. Several more turns through the neighborhood and I wait at a light to cross an arterial road in front of Old Orchard Mall. The light changes. With a few more pedal strokes I arrive at my destination. I’m smiling ear-to-ear. I did it! 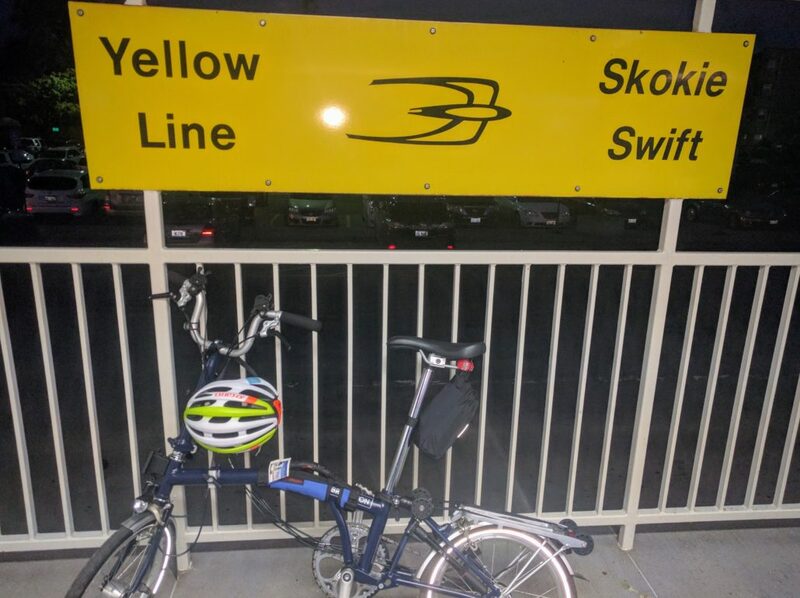 I can proudly add Skokie to the list of places I’ve biked. 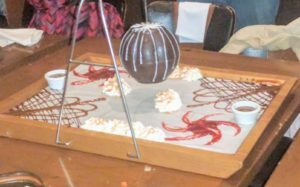 Fortified by a fruit-filled chocolate piñata, I’m ready to retrace my path back to the ‘L’. I read over the directions once more as I unfold my bicycle. It’s well past 10 PM and the streets are empty. I easily navigate back through neighborhood streets and come to a two-way stop sign. I signal my intention to stop as a car pulls up behind me. If they don’t turn I’ll encourage them to pass on the other side of the intersection. I’ve nearly stopped as I hear a “beeeeeep” coming from behind me. I’m startled, and land on my feet in an ungraceful dismount I hope no one caught on video. She rolls down her window. I showed her what the stop hand signal looks like and wished her a nice night. I pedal on uneventfully retracing the remainder of my route. After a quick jughandle turn, I happily find myself back at the ‘L’. 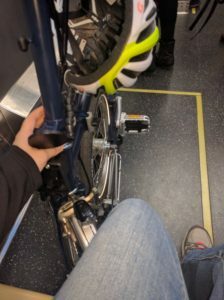 I fold up the Brompton and board the train back to the apartment for the night. I can’t wipe the grin off my face. I’ve successfully biked in an metro area where I loathe driving a car. Those 3.6 miles were as transformative as ditching training wheels as a child. 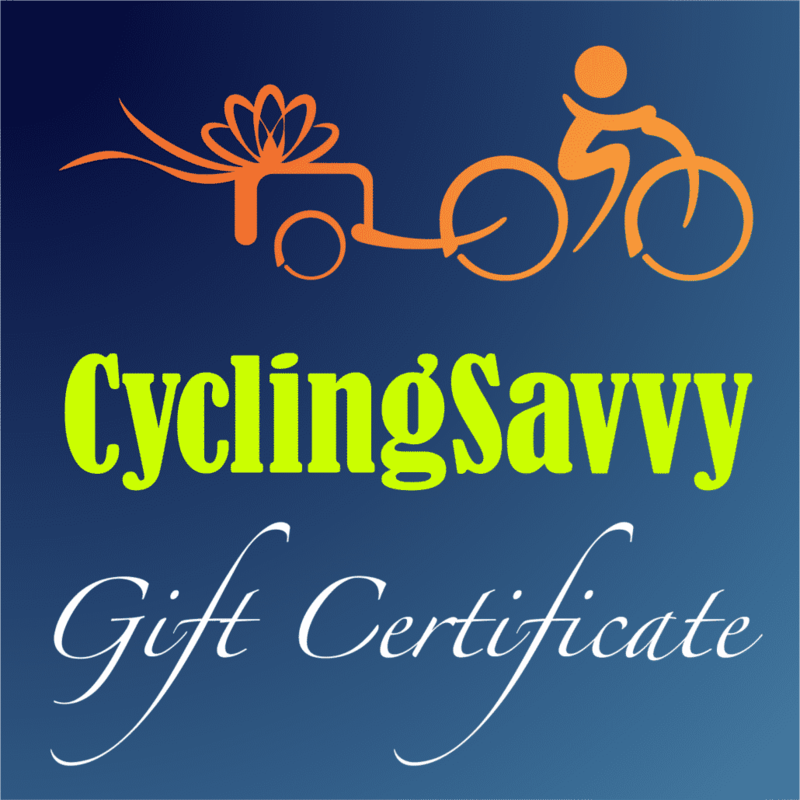 I used savvy cycling in Chicagoland and nothing happened! Yes, one motorist honked at me. She was confused and apologetic. I’m on the top of the world. Next stop Los Angeles? New York? Boston? London? Clearly, the skills I refined in CyclingSavvy will serve me well, even in big cities with intimidating traffic.